Local people are being invited to take a tour round Harrow Central Mosque this Sunday as part of the Visit My Mosque scheme. The mosque on the corner of Station Road and Rosslyn Crescent is one of more than 250 mosques across the UK taking part in the nation-wide scheme aimed at building bridges between communities. The mosque will be open to the general public from 2.30pm to 5.30pm on Sunday, March 3. Activities will include a guided tour, a chance to meet the Imam, and see live prayers at 4.15pm. There will also be a Q&A session and free refreshments on offer. Free parking is available at the Civic Centre car park in Station Road. 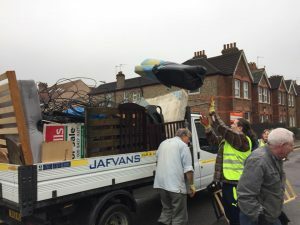 The loss of parking facilities at the Civic Centre site in Station Road could result in “mayhem”, leaders at Harrow Central Mosque have warned. Currently people who attend the mosque are able to park in the Civic Centre car park. However, the number of public parking spaces is set to be dramatically reduced in order to make way for new homes. Harrow Council is due to submit plans to demolish the Civic Centre and build 850 new flats and houses. This major development is also expected to include a new primary school, GP surgery and shops. However, there is widespread concern about the impact on parking especially during busy periods at the mosque such as the month of Ramadan. One mosque elder pointed out there are already problems with people parking across driveways and in residents-only parking spaces near the building. He warned that this would only get worse if parking provision at the Civic Centre site was reduced, predicting there would be “mayhem”. HCRA committee members met with the mosque committee earlier this week to discuss potential problems relating to the “Poets Corner” development, including the issue of parking. The two organisations have now teamed up to organise a public meeting this Friday to give local people the opportunity to express their views. A “street stress survey” to assess how people get to and from the mosque found current parking provision was full to capacity during Ramadan. While many people shared cars as part of efforts to reduce the number of vehicles the survey found this still meant a substantial number of cars coming and going. Harrow Central Mosque said it was still waiting for the council’s response to the research and a petition signed by hundreds of mosque-goers. The council has previously suggested there could be a park and ride scheme to ferry people to and from the mosque. However, no suitable site has been found and the mosque has raised questions about the practicality of bus-ing large numbers of people to the building in time for daily prayers at set times. The mosque has encouraged worshippers to make use of public transport but this may not be possible for those attending prayers very late at night or in the early hours. Cycling is another option but many mosque users are too old and frail to jump on a bike. Other concerns about the Poets Corner development include the lack of green space. pedestrian access to Harrow and Wealdstone station, and the impact on traffic and local services. A formal planning application is expected to be submitted before council elections in May. The public meeting organised by HCRA and Harrow Central Mosque will take place at the Jaspar Centre – the former magistrates’ court – in Rosslyn Crescent from 6.30pm to 7.30pm on Friday, March 1. The meeting is open to everyone with an interest in the Poets Corner plans. Residents fear the probation office building in Rosslyn Crescent could swiftly become a derelict eyesore after it was confirmed the facility had closed for good. Harrow Council, which is the freeholder of the building, has said it is looking for a new tenant. However, the erection of an imposing chain-link fence around the site suggests it could remain empty for some time. If a new occupant cannot be found then the land may well be sold off to make way for more news homes as Harrow strives to hit housing targets. 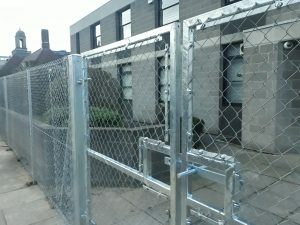 “The probation office is an incredibly ugly breeze block building and now a big metal fence has been erected making it look even worse,” said Rosslyn resident Jo Stephenson. 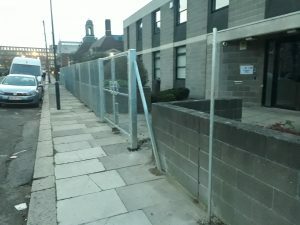 Greenhill councillor Keith Ferry confirmed the freehold of the former probation centre was held by Harrow Council and that the probation service’s lease had expired. “The council has secured the property whilst we search for a new tenant,” he told HCRA. If a new tenant is not found then the most likely course of action will be to redevelop the site amid pressure to build thousands of new homes in the borough, which has led to a flurry of applications. Plans to demolish outdated office buildings on the opposite arm of Rosslyn Crescent and build more than 50 new homes have been submitted to Harrow Council. A large-scale HMO (house of multiple occupation) was recently built at the top of Woodlands Road and there are plans to redevelop Watkins House care home at other end of the street. Meanwhile local people are steeling themselves for the major redevelopment of the Civic Centre site with plans for 850 new homes. 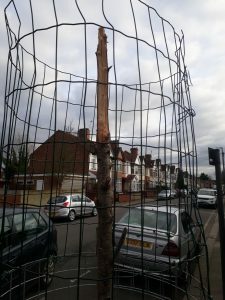 A new tree in Frognal Avenue has been vandalised within days of being planted. 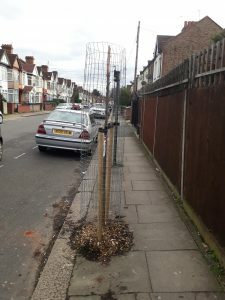 The tree, which cost £250, was planted by Harrow Council and funded by a local councillor from cash set aside for community groups. It was planted as part of HCRA’s ongoing campaign to green-up our area, which has seen more than 30 new trees planted in recent years. Residents expressed sadness and anger after the tree was snapped in two just days after it went in. This is not the first time that trees funded by local people have been damaged or destroyed by vandals. “Trees improve the look and feel of an area by bringing much-needed greenery to our streets,” said HCRA’s tree officer Helen Grimes. “Volunteers from HCRA work really hard to raise money for new trees and get them planted so it is devastating when they are damaged. HCRA has informed Harrow Council and hopes another new tree will be planted in the same spot. Several Greenhill residents have received scam phone calls from criminals pretending to be from the tax office, according to police who have warned locals to be on their guard. The scammers rang up claiming to be from HMRC (Her Majesty’s Revenue and Customs), warning the body was filing a lawsuit. Startled victims were then asked to press 1 to speak to a caseworker and make a payment. HMRC has confirmed this is a scam and has advised anyone who receives such a call to hang up immediately. The same trick has been widely reported elsewhere with the gang behind it often targeting elderly and vulnerable people. Other scam calls may offer a tax refund and then request bank or credit card information. HMRC has asked anyone targeted to report incidents, providing as much detail as possible, including the date of the call, phone number used and content. Scam calls can also be reported to Action Fraud. We have just had a wonderful offer from our local brilliant seed company, Seeds of Italy (also on Facebook here), who are based at Unit D2 Phoenix Business Park in Rosslyn Crescent. They will provide us with free sunflower seeds so that we can try and make the garden outside Nisa beautiful again. Thank you so much to Paolo and his whole family, you have very big hearts. 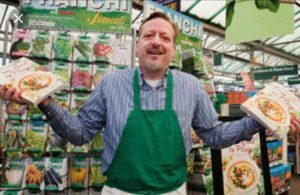 If you’ve not visited Paolo, pop down there; it’s a little secret gem in Harrow and the only UK seed company left in existence. There’s lots more in his warehouse than seeds, he’s even got a little Italian deli! And yes, they’re open on a Saturday too. Residents have expressed shock and anger after the community garden they worked so hard to create was brutally hacked to the ground. 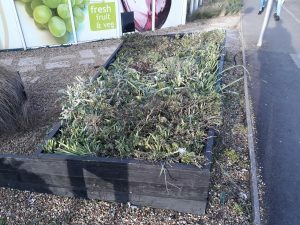 The garden – outside the Nisa convenience store in Station Road – was built and planted by volunteers in 2015, who were nominated for a Harrow Heroes award for their efforts. It was funded by grants from gardening charity Harrow in Leaf, Nisa’s own Making A Difference Locally community fund and Harrow Council with countless other donations from individuals and local businesses. In total residents raised more than £3,500 to turn what was a scruffy patch of wasteland into a garden for everyone to enjoy. They were therefore horrified to find that much of the garden had been cut down to the ground with many plants dug up by the roots. HCRA understands the shop recently changed hands and the garden was destroyed by the new managers. The association has contacted the manager of the shop and Nisa head office to ensure no further damage is done. The garden was designed by a professional garden designer who carefully selected plants that would work in the space and provide year-round interest. Children from the local primary school helped plant daffodils to ensure a burst of colour in the Spring. 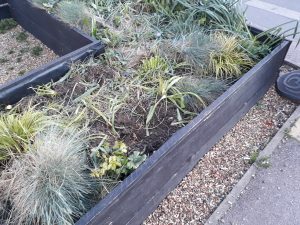 Since it was finished in autumn 2015, members of HCRA have continued to maintain the beds including doing weeding, pruning and picking up litter. When part of the garden was damaged in a fire, volunteers again raised money for new plants. Those who worked on the garden said they were “devastated” by what had happened. “When I saw the garden I just wanted to cry,” said HCRA member Jo Stephenson. “We had some beautiful and healthy shrubs that have just been hacked to the ground. “Many of the plants were just coming into flower. For example, we had some lovely purple aliums that were just about to come out but they have been cut down in their prime. “We also had a lot of beautiful hebe shrubs that form into big round balls and cost about £20 each but many of these have been totally destroyed. HCRA hopes to work with the shop and Nisa to replant and repair the garden.